What Smart Money Thinks about Caleres Inc (CAL)? Hedge fund managers like David Einhorn, Dan Loeb, or Carl Icahn became billionaires through reaping large profits for their investors, which is why piggybacking their stock picks may provide us with significant returns as well. Many hedge funds, like Paul Singer’s Elliott Management, are pretty secretive, but we can still get some insights by analyzing their quarterly 13F filings. One of the most fertile grounds for large abnormal returns is hedge funds’ most popular small-cap picks, which are not so widely followed and often trade at a discount to their intrinsic value. In this article we will check out hedge fund activity in another small-cap stock: Caleres Inc (NYSE:CAL). Is Caleres Inc (NYSE:CAL) a healthy stock for your portfolio? The smart money seems to be taking a pessimistic view, as the number of long hedge fund positions that are disclosed in regulatory 13F filings contracted by four during the third quarter. In this way, the company was included in the 13F portfolios of 17 funds tracked by Insider Monkey at the end of September. At the end of this article we will also compare CAL to other stocks including Tree.com Inc (NASDAQ:TREE), GasLog Ltd (NYSE:GLOG), and Benchmark Electronics, Inc. (NYSE:BHE) to get a better sense of its popularity. With all of this in mind, let’s go over the fresh action surrounding Caleres Inc (NYSE:CAL). How are hedge funds trading Caleres Inc (NYSE:CAL)? At the end of the third quarter, a total of 17 of the hedge funds tracked by Insider Monkey were long this stock, down by 19% from the end of the second quarter. 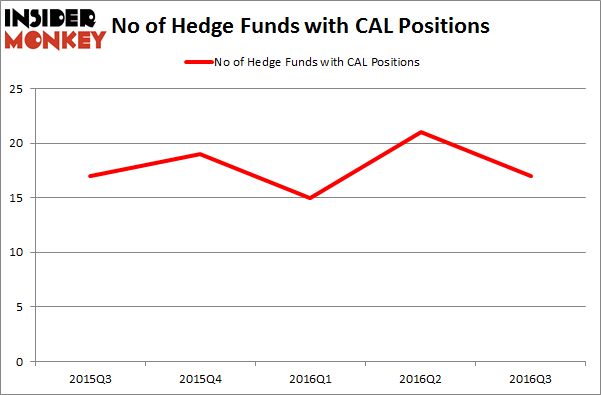 Below, you can check out the change in hedge fund sentiment towards CAL over the last five quarters. So, let’s find out which hedge funds were among the top holders of the stock and which hedge funds were making big moves. Of the funds tracked by Insider Monkey, Chuck Royce’s Royce & Associates has the largest position in Caleres Inc (NYSE:CAL), worth close to $25.7 million, amounting to 0.2% of its total 13F portfolio. The second most bullish fund manager is D. E. Shaw’s D E Shaw holding a $4.5 million position; less than 0.1%% of its 13F portfolio is allocated to the company. Other professional money managers that hold long positions contain Steven Tananbaum’s GoldenTree Asset Management, Steve Cohen’s Point72 Asset Management, and John Overdeck and David Siegel’s Two Sigma Advisors. We should note that none of these hedge funds are among our list of the 100 best performing hedge funds which is based on the performance of their 13F long positions in non-microcap stocks.